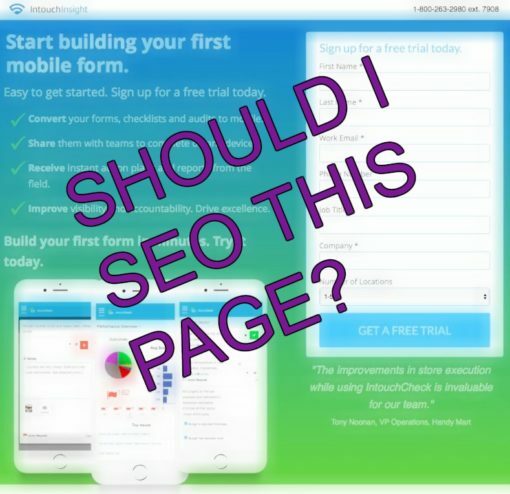 Should I SEO for Lead Gen Forms or Campaign Landing Pages? Should I SEO a Campaign Form Page? Zero Value Content: These pages tend to filled with marketing jargon, doesn’t answer a question, and extremely-thin on content that is considered valuable to search engines. Lowwwww Wordcount: Fewer than 100 words. You can’t rank well on even the lowest competitive long tail with 78 words on the page. Expire: The page goes away in five week or five months. Any page that is temporary in nature won’t have enough time to garner enough authority. No Maintenance: Even if the page sticks around, it likely won’t get a refresh… ever and we all know how Google prefers sites that continually update their information. Not in Website Experience: The page is usually a URL folder that has little SEO authority tied to it. It’s essentially an orphan page with no subsections or pages below or above it supporting it. Doesn’t Link Internally: Related to above, it has no internal links to/from related pages that gives context to Google about it’s importance in the site’s hierarchy. No One Cares Outside: Good luck getting another website to link to a form page that has no valuable content. Dead Before It Starts: In a competitive space that requires the page to be… well, more than it is. That’s not to say a form page or campaign page won’t be indexed by Google and other search engines, but indexation doesn’t mean anyone is visiting the page from organic searches. That said, these pages should have the SEO titles and descriptions in case they’re shared on social media or rank for extreme long tail keywords. We recommend creating a plan and best practice doc for your teams so they can create meta data for themselves.